We are so thankful to the wonderful local businesses who donated to our Groov-a-thon fundraising dance party, we have the best neighbors!!!!! Want to help support a great community program? Join us on Saturday, October 6th from 6-10pm to support our community movement program. Groov-a-thon is going to be a DANCE PARTY!!! 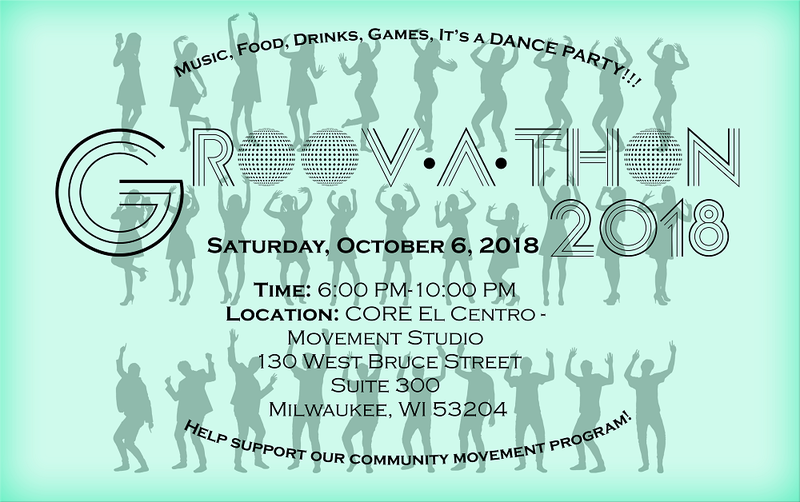 Groov-a-thon 2018 will celebrate the movement program at CORE EL Centro through dance. The goal is to raise money so CORE El Centro can continue to offer movement classes such as Zumba, belly dancing, yoga, yoga for people with chronic conditions, creative movement for special needs adults, and conscious dance all on a sliding fee scale. Planning to dance at Groov-a-thon? Have you set up your fundraising page? It's so easy! Just follow this link http://groovathon-2018.everydayhero.do/and hit the button that says "start fundraising" to set up your page! Help support creative movement classes for special needs adults! Help support children's yoga classes!